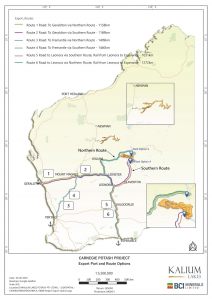 In July 2018, Kalium Lakes and BCI Minerals Limited (BCI), the owners of the Carnegie Potash Project (CPP) via the Carnegie Joint Venture (CJV), announced the completion of the Scoping Study and a maiden Resource and Exploration Target for the CPP in Western Australia. A summary of the Scoping Study is provided below and further information is contained within the JORC (2012) and NI 43-101 Technical Report, compiled by German Potash Experts and Competent Persons, K-UTEC AG Salt Technologies (K-UTEC) – link to ASX Announcement also appears below. Scoping Study, Maiden Resource and Exploration Target confirm the CPP has potential to be a technically and economically viable project. 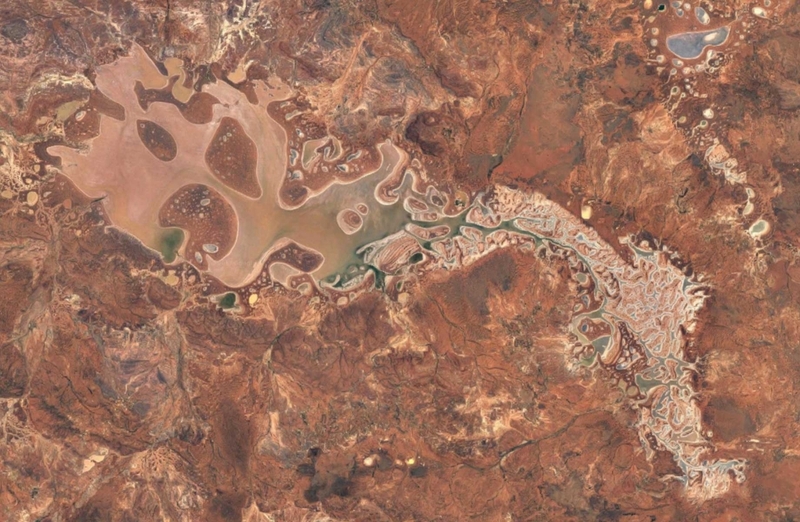 Scoping Study leveraged the significant technical knowledge, experience and intellectual property developed by Kalium Lakes in advancing their Beyondie Sulphate of Potash Project. Inferred Resource of 0.88 Mt SOP @ 3,466 mg/l K1 (equivalent to 7,724 mg/l SOP) based only on the top 1.7 metres of the 27,874 hectare surficial aquifer on granted tenement E38/2995 plus an Exploration Target2 for material below the top 1.7 metres. A further 82,000 hectares of lake surface on pending tenements is not included in the current Inferred Resource or Exploration Target, providing further resource upside potential. BCI Minerals has now earned a 30% CJV interest and Kalium Lakes holds a 70% interest. The JV Companies have endorsed proceeding to a staged Pre-Feasibility Study, with an initial focus on securing tenure and access to all required tenements. In March 2017 BCI Minerals Limited (ASX:BCI) and Kalium Lakes Limited announced that the companies had entered into a joint venture agreement over Kalium’s 100 per cent owned Carnegie Project. The Carnegie Project is a potash exploration project located approximately 220 kilometress north-east of Wiluna that comprises one granted exploration licence and two exploration licence applications covering a total area of approximately 1,700 square kilometres (see map below). The Carnegie Project is highly prospective for hosting a large sub-surface brine deposit which could be developed into a solar evaporation and processing operation that produces sulphate of potash (SOP). 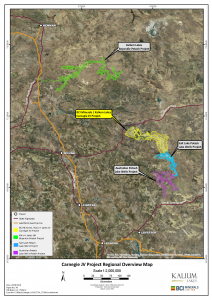 Under the terms of the Agreement, BCI Minerals can earn up to a 50 per cent interest in the Carnegie Project, by predominantly sole-funding exploration and development expenditure across several stages. Kalium will be the manager of the joint venture. Under the terms of the Agreement, the parties will form an unincorporated joint venture over the Carnegie Project with BC Iron having the right to earn up to a 50 per cent interest in a sequential staged manner. During an initial Scoping Study Phase (Stage 1), BCI Minerals (formerly BC Iron) can earn a 30 per cent interest in the Carnegie Project by contributing its mobile camp facilities to the joint venture and sole-funding the first $1.5M of expenditure. During a Pre-Feasibility Study Phase (Stage 2), BC Iron can elect to earn a further 10 per cent interest in the Carnegie Project (for a total interest of 40 per cent) by sole-funding a further $3.5M of expenditure through Stage 2. During a Feasibility Study Phase (Stage 3), BC Minerals can elect to earn a further 10 per cent interest in the Carnegie Project (for a total interest of 50 per cent) by sole-funding a further $5.5M of expenditure through Stage 3. Kalium will be appointed the manager of the joint venture, allowing the parties to leverage Kalium’s experience and expertise in developing their primary potash project, Beyondie, which is at an advanced pre-feasibility study stage. Kalium will also contribute relevant intellectual property from the Beyondie Project, which is expected to materially reduce the time and cost of progressing the Carnegie Project towards development. The Manager will report regularly to a Joint Venture Management Committee. Further strengthening the parties’ co-operation on solar evaporation projects, BC Minerals has provided Kalium with the right to acquire a 50 per cent interest in the Mardie Project at certain development stages. The Mardie Project, which is located on the coast approximately 100km south-west of Karratha, has a large area of natural salt lakes, making it highly prospective for solar salt production with many similarities to other successful solar salt operations in the region. BC Iron is currently completing a high level scoping study on a potential 3 Mtpa solar evaporation salt operation at Mardie, with an aspirational goal to potentially strengthen Australia’s position as the largest exporter of solar salt globally in the future. BCI Minerals is an ASX-listed development and mining company with a portfolio of assets primarily located in the Pilbara region of Western Australia. The Company’s key assets include Iron Valley and Buckland. Iron Valley is an iron ore mine located in the Central Pilbara. The mine is operated by Mineral Resources Limited (MIN) under an ore purchase agreement with BC Minerals and is generating low risk royalty earnings for the Company. 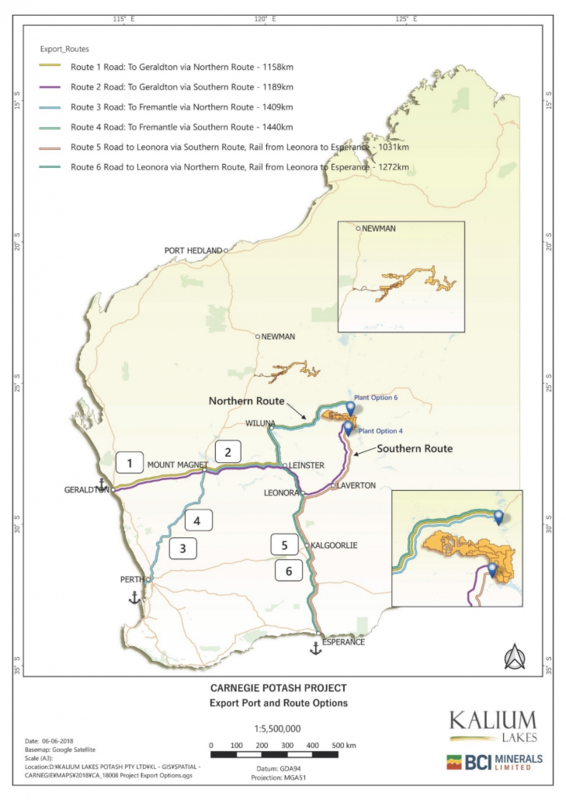 Buckland is a strategic iron ore development project located in the West Pilbara region, comprising a proposed mine at Bungaroo South and a proposed infrastructure solution incorporating a haul road and transhipment port at Cape Preston East. It has a completed feasibility study and all primary tenure and approvals secured. BCI Minerals holds a number of other exploration stage projects in a range of commodities and potential iron ore royalties over the Nullagine, Koodaideri South, Extension and Breakaway tenements. The Company is also targeting new opportunities with a strong value proposition and near-term earnings potential, including commodities other than iron ore.